There is power in having small financial goals that once achieved allow you to take stock and then decide on the next goal. 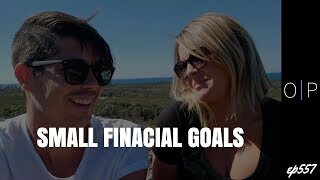 In this episode I’m joined by my wife Kelly and we discuss why big financial goals can actually be a bad idea and how a goal like baseline financial freedom can set you up for success. Hi Guys, Ryan here from on property and today I am joined by Kelly. Hey guys. And we wanted to talk about the power of small financial goals in your life. And this discussion kind of started when we’re talking about the power of aiming for baseline financial freedom rather than extreme wealth, but then kind of evolved from there. So do you wanna kind of expand on this idea? Well, I always loved the idea of they’re actually achievable as opposed to like these ginormous things that, well I certainly feel overwhelmed by goals that are just so far out there in the future and I love the ID that you can kind of set a goal that keeps you from just not being present in your life. Like you’ve, you’ve setting a goal that’s like decades in the future. You’re like, you’re not going to look up for decades. Like you’re not going to be present in your life until you achieve that goal after, if you hopefully achieve that goal and even then you’re going to be that same person that you are when you said it. Yup. And so really the revelation for us came, I had the goal that I wanted to be financially by 30 thing. I wanted to be a millionaire as well. It’s definitely didn’t. But I had that goal and head down, bum up for many years. We strived after that goal. I would work long hours, we still had kids and we’ll still living life, but we kind of felt like will sleep walking through a bit of our life. And then we got to the point where it was like, okay, we don’t really need to work anymore. We’re not rich by any stretch of the imagination, but our bills are paid and our lifestyle is covered. And then we got to that point and took stock and we realized how unhappy you were. wrong with doing that. If you know, if you’re, if that’s what you want and that’s nothing probably prep. Yeah. It’s just being more realistic, isn’t it? So that you’re just not missing out on your life striving for a goal that you don’t even necessarily want. Yeah, so I think the big revelation for me was that when we hit that goal a couple of years ago and then I wasn’t happy, I thought I would be happy when I achieve financial freedom and I wasn’t. And it took us a journey of 18 months, two years to get to where we are now. We feel more comfortable in our lives and in our own skin and in our relationship. Yep. Um, so much of that as well as like really just slowing your life down, isn’t it? So if achieving small goals, you’ve got time to achieve when you’ve achieved the goal, you can stop, take stock, look around you and then set a new one and you can do that at intervals throughout your life, which I think is so much safer as well. So be on target with what you actually want your life to look like. I liked what you said about how you changed as a person over the decades and one of the problems that I see is that people set the goal based on not, not really knowing what it’s going to be like when they get there, but they sent this highly ambitious financial goal to be super wealthy, to have a massive mansion on the beach in Sydney, to have the cars and the lifestyle and everything like that. They set that goal head down, bum up for 10 years, 20 years, 30 years, 40 years, and then they waste all this time in their life, achieve it, and then they realize that stuff didn’t make them happy. Anyway. That’s my biggest fear is that people will spend all of this time striving for a goal that in the end won’t make them happy because you don’t actually know until you achieve it, how you’re going to feel once you achieve it. Definitely. And that frightens me. Well, it’s funny as well, like how uncomfortable it is. I mean when you’re setting, when you’re setting a goal. I remember talking to her, one of our friends and hate set this big goal and like he was about to achieve it and I was like say like, what are you going to do? Like when you achieve it, like, like there’s going to be so sad and he’s like, we’re just sent another go black. And I was like, oh, that’s kind of disappointing. Really. I’m not a gold. That’s it. But just thinking about like even just stopping. Like for us, it was so uncomfortable having achieved a goal like people think that it’s going to be amazing, but it’s really great. It was really quite hard and so challenging to be like, I am aware that I am unhappy. Why am I so unhappy? Like and just really looking around you and deciding, okay, well you’ve got to find out, well what does make me happy and if it’s not the match and then what is it I don’t want to get to the end of my life and I’m not even thought about that. I’m always shocked as well that people don’t actually think about being financially free. Like I’ve had conversations with people and the idea of actually getting money for free. Like you’re not physically doing light, but for that at a later date isn’t even something that they’ve even considered as a possibility for their lives. So what do they think about? They just think, oh, I’ve gotta go to work and I’m going to step myself up, but they don’t even like even having an investment property, but the investment property just sits there and they’re just working really, really hard and like this I realized that he could just like away you can do other things that you’ve been doing eight and it could be work like there’s nothing wrong with going to work. Like we certainly really enjoy and find fulfillment in going to work. We’re working right now. That’s right. It’s just crazy to me that like I just hope that people that watch this, it just can open our eyes a little bit more to just say that there is so much variety and so much choice in how you live your life and that it doesn’t have to rely on just going to work. realize. People don’t realize that that is missing important part. They think the pots, the most important. Yeah. The equity and the capital and how much money they have in the bank is the most important part and that’s why I still height negatively geared properties. Even though you can make him some money through capital growth is just the fact that it doesn’t liberate you. People are making all this money on paper, but it’s not impacting their life in any way. Yeah, for sure, and that was one of the things that I come up with Ben Against Ben because he’s so analytical and so he can look logically and say, well, this is obviously the best path in the best investment strategy, but then I look socially at people and I say, well, life happens as you’re investing. That’s divorce happens, job losses happen, sickness happens, and also as we talked about each change as people, all of that stuff happens as you’re investing, so to just go into it with a logical mindset and say this is logically the best thing. I prefer to be like, which investment option is going to give me the most options, no matter what life throws at me. So if we go ahead and invest, then what’s going to happen if we a divorce, so how can we invest in a way that’s like going to be good? So how can I have bank accounts offshore? But yeah, just thinking about those things in investing in a way that if we were to lose our job or to lose our business, then we wouldn’t be negatively kid and be really stressing about money because those properties would not only be paying for themselves by giving us a bit of extra cash. What’s so amazing though about this level of financial freedom is that it’s actually really safe. Like there’s a lot of people are scared to invest because it sounds really daunting and they feel like there’s heaps of risk. But actually if you set it up in the right way in the way that you guys talk about, then it’s like this really safe way to do it. But you can, you really are set up and then you protect it. buying like an apartment block, you know, like have all these units, you know what I mean? Like is this massive outlay and like a big stress. If it doesn’t go perfectly, then you go bankrupt. Yeah. Yeah, exactly. Totally. Yeah. And that’s so good. Yeah. I just love that idea that when the property is a positive cashflow, if you’re working and enjoying your work and everything, then that’s fine. You can continue to pay off those properties as quickly as possible and focus on accelerating, paying off the debt of those properties. But then if stuff happens in life and you lose your job or someone quits their job or something like that, like in the show that we’ve been watching, you may her now he just like ups and quits his job that day. Can you give me a really slick Willy Nilly? We need to see. Say like, he quit his job that day, so they dropped down to one income than she was nearly going to quit but couldn’t. Yeah. And if you’re negatively geared then you can be in a position where neither of you can quit. Whereas if you positive then you’re trapped in. And that’s what. Yeah, I hate that being trapped and not being for. And that’s what I love about. Yeah. Yeah. No, just aiming for something smaller and doing it in a way that gives you choices. Yeah. Yeah. And yeah, so, so great. Yeah, so we hope that this helps and inspires some of you out there that just because you see people in private jets doesn’t mean that that’s what you need to aim for and I think the risk in putting your head down for decades in order to achieve something, you’re not sure whether or not it’s going to make you happy. That’s a risk that I’m just not willing to take and I think other people should heavily consider before they go down that path because we have seen people as well who have gone down that path and extreme like achieved great wealth and then the loss at all or their lives are falling and so then they end up rich, but they’ve got not a happy life. And so yeah, we just want to encourage you guys today to think about that. Obviously everyone’s different, so this is not for everyone, but this has worked for us and coming to any announcing today makes us happy and costs us nothing. So Richard. All right, that’s it from us. Don’t forget to subscribe to the channel. As we got new episodes coming out almost every day and until next time, stay positive.